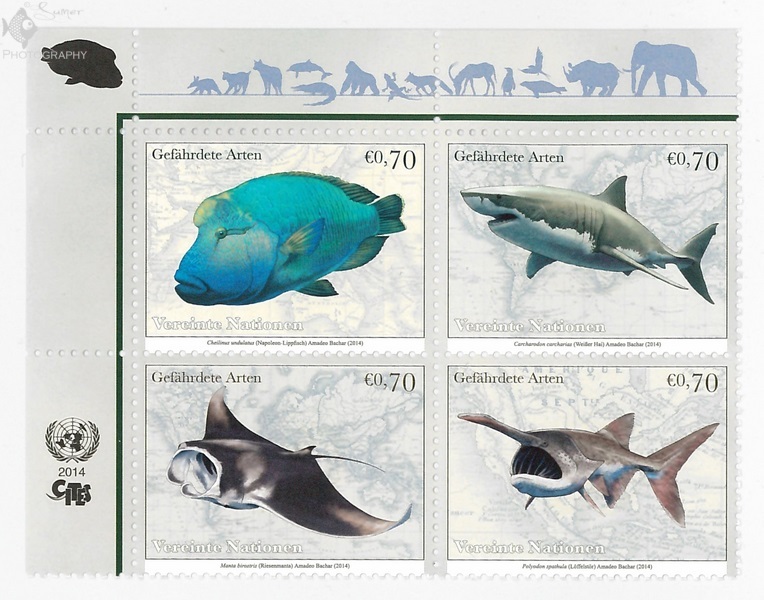 Being a stamp collector, I am always looking for interesting stamps, and I get most excited when both my hobbies (fish keeping and stamp collecting) meet. 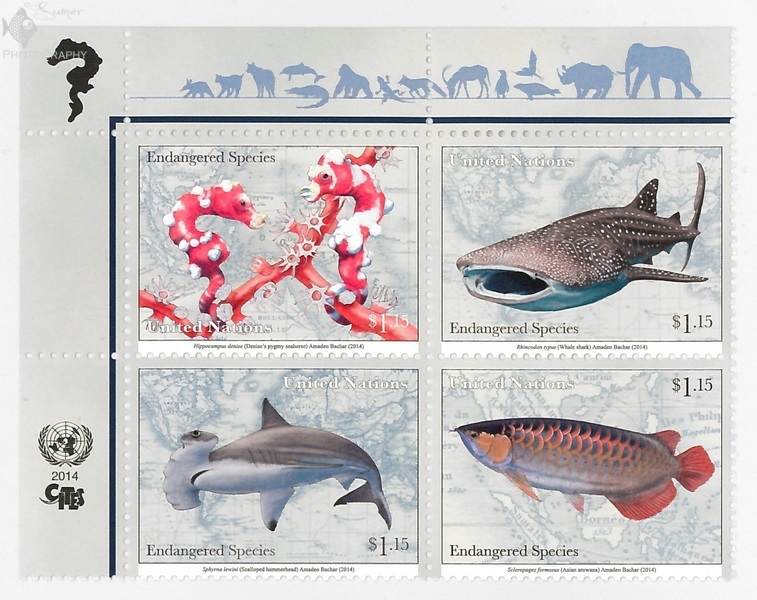 UNPA (United Nation Postal Administration) has recently issued a set of 12 stamps in the series of “Endangered Species” for the year 2014. 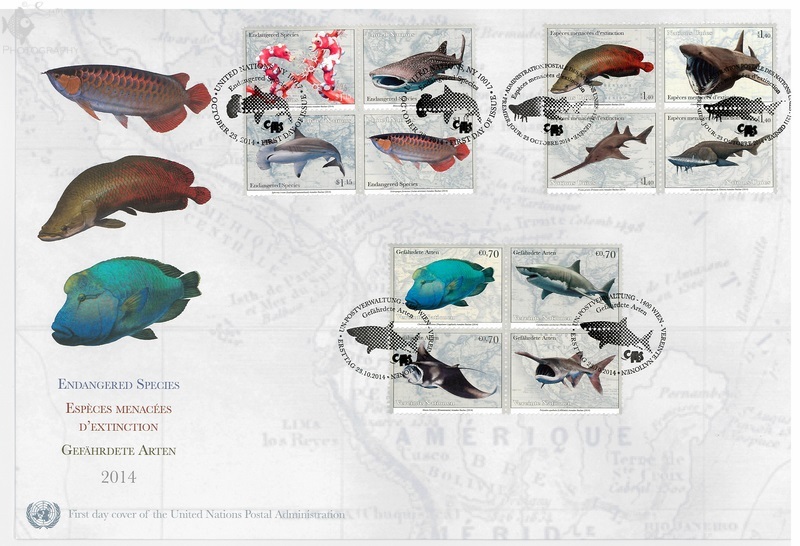 This year they have featured endangered fish species. UNPA started the series “Endangered Species” in 1993. This series is their effort to showcase and promote the protection of endangered species with publicizing CITES (the Convention on International Trade in Endangered Species of Wild Fauna and Flora). This year it is their 22nd set in this series. This year’s stamps are designed by a USA based artist Amadeo Bachar. Hippocampus denise (Denise’s pygmy seahorse): A very small and well camouflaged animal which doesn’t grow bigger than 1.0-1.5 cm. Rhincodon typus (Whale shark): The biggest fish in the ocean which is a filter feeder. They can measure up to 20 meters long and 34,000 kilograms heavy. Sphyrna lewini (Scalloped hammerhead): The well known hammerhead shark which lives in the warm tropical water. Its population is decreasing very fast because of shark finning. Scleropages formosus (Asian arowana): Almost all of us are fans of this beautiful freshwater fish from Southeast Asia. Habitat loss is the main cause of them being an endangered species. They are not allowed to be imported or kept in the USA due to their inclusion within the Endangered Species Act. Cheilinus undulatus (Humphead wrasse): The biggest wrasse in the ocean is also an endangered species. A slow breeding rate, illegal fishing and habitat loss are the main reasons behind the decline of its population. Carcharodon carcharias (Great White shark): This fish doesn’t need an introduction. It has been a star of many films and documentaries. Shark finning and illegal fishing of this species are two main reasons for their declining population. Manta birostris (Giant Manta ray): The biggest ray in the world has always been a fascinating animal. Their bat like appearance in the ocean makes them very interesting animal. Targeted fishing and pollution are two main threats to this species. Polyodon spathula (Paddlefish): A freshwater species found in Mississippi river drainage in the America. Habitat loss, poaching and introduction of other invasive fish species in their habitat are the main reasons for their declining population. Arapaima gigas (Arapaima): One of the biggest freshwater fish species in the world which is found in the Amazon river basin in South America. Overfishing for food and habitat loss are two main reasons of their declining population. On the contrary, this species has been introduced in many other tropical regions (some South American countries like Peru and allegedly in Southeast Asia as well) where they have become invasive. 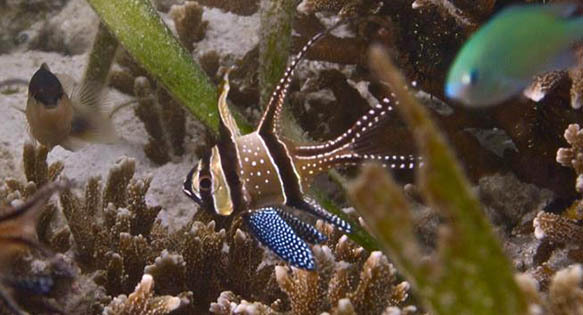 They are capable of wiping out many other endemic species of fishes if introduced to tropical regions. Cetorhinus maximus (Basking shark): The second largest fish alive which also is a filter feeder. Just like whale sharks, they also eat plankton. Targeted fishing for flesh, shark fin, shark liver oil is the main reason for their fast declining population. Pristis pristis (Largetooth sawfish): Largetooth saw fish is fighting with habitat loss and overfishing. They become entangled in abandoned fishing nets very easily due to their saw-like snout. Acipenser baerii (Siberian sturgeon): This freshwater species becomes a great addition to ponds. Habitat loss, poaching and pollution are the main reasons for its declining population. 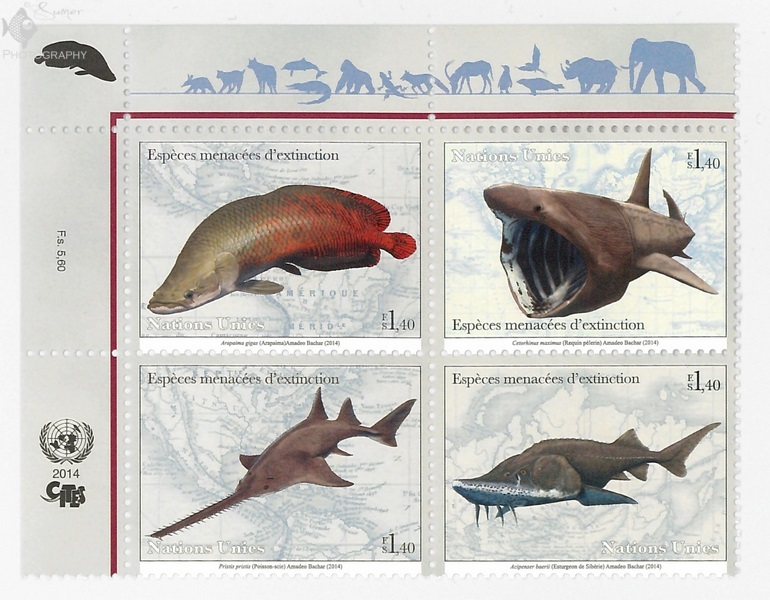 I hope this set of stamps depicting 4 freshwater and 8 saltwater fish spreads some awareness about these animals. 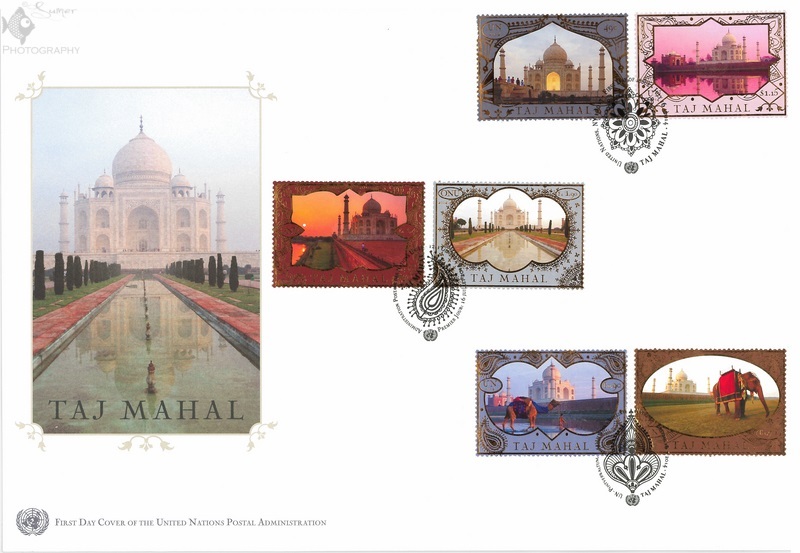 I hope you enjoyed looking at these beautiful stamps. Please share your views in the comments below.